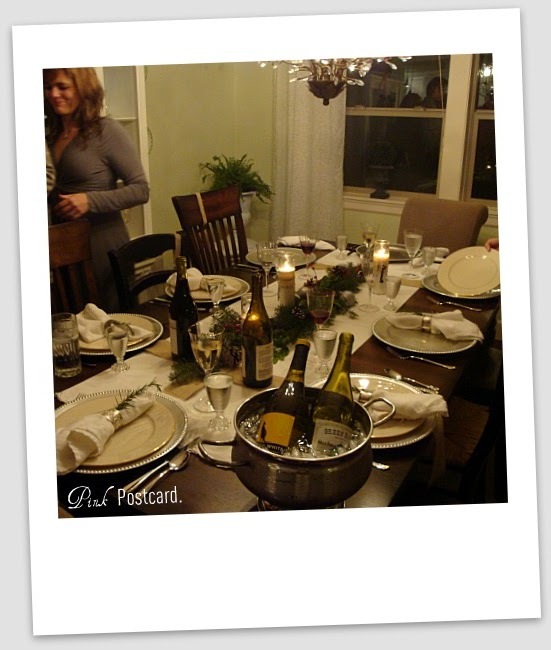 Our Progressive Dinner was so much fun! We enjoyed some great food and made some fun memories. 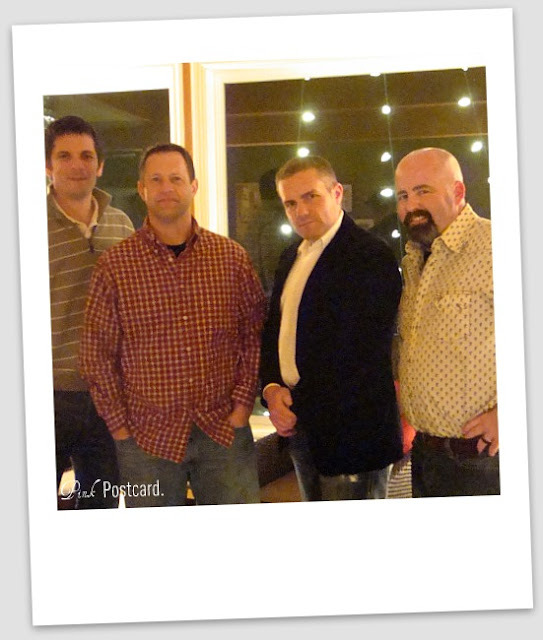 One thing that I am so thankful for when it comes to events like this, is my hubby's help. We really work pretty well together to divvy up the jobs beforehand. Last year, I felt really rushed, and I attribute that partly to not having our table ready. #1: If you're able, set your table the day before- you will feel more confident in how the decor turns out, and have time to focus on other things. #2. Music is something we always have at our parties. Set up your play list a few days in advance. 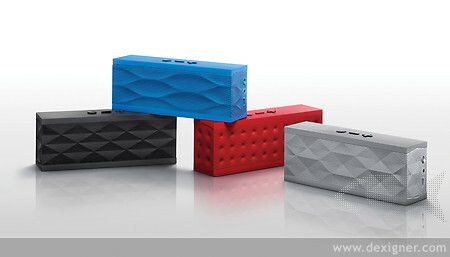 One thing that we are REALLY loving is the Jambox. It's small, puts out some great sound, and because it is wireless, you can hide it / place it anywhere. Your play list comes from your iPhone. Genius. #3. I always lay out my serving pieces (including flatware) so I won't be running around at the last second. 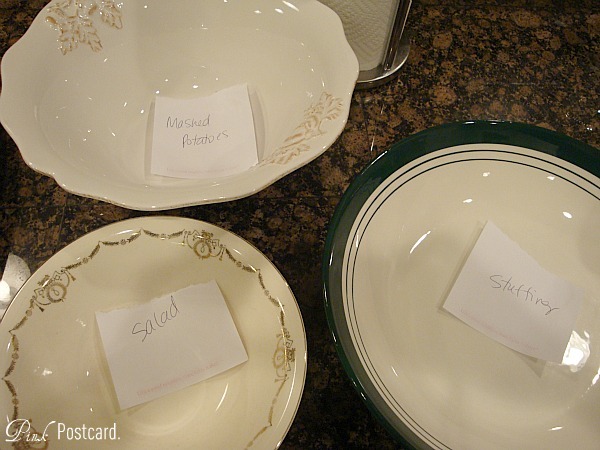 If you have helpers who will be dishing up or bringing food, put sticky notes on your bowls / platters so everyone knows exactly what goes where. #4. Candles! 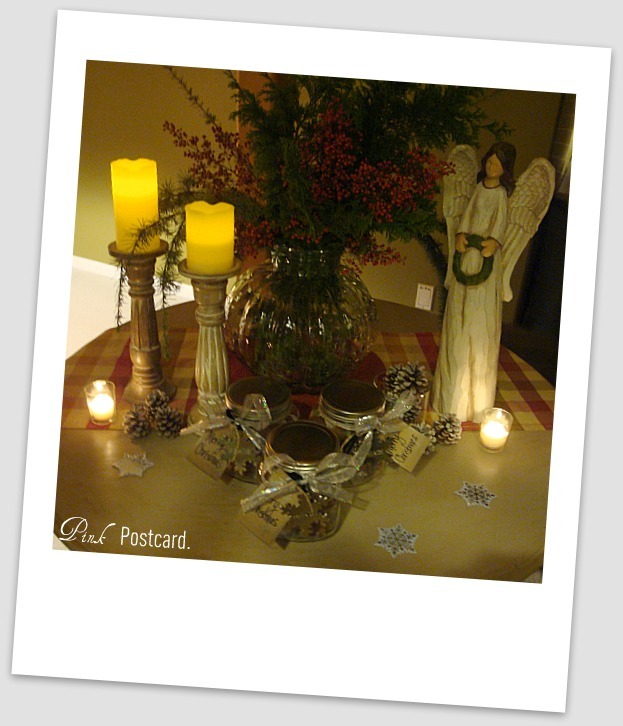 I always prefer votives- they are versatile to use anywhere and everywhere, and inexpensive to buy. Safer than tapers, no drips to clean up off of the table or furniture, and they cast a beautiful glow. We put scented ones in our powder room and entry, and unscented in our dining areas. We also installed a dimmer switch on our dining room chandelier, and it was one of the best things we ever did! #5. I prefer making things from scratch whenever possible when it comes to the food, but let's face it- sometimes that can be more trouble than it's worth by the time the event rolls around. A combination of 'from scratch' and some ready made / pre-packaged items is great. Making as much a head of time is always a smart move too. I did this with our mashed potatoes the day of the party. They were cooked later in the afternoon, and then put in a crock pot on low to keep warm until it was time to serve. A couple years ago I invested in a warming tray, and it was one of the best purchases ever! Highly recommend! 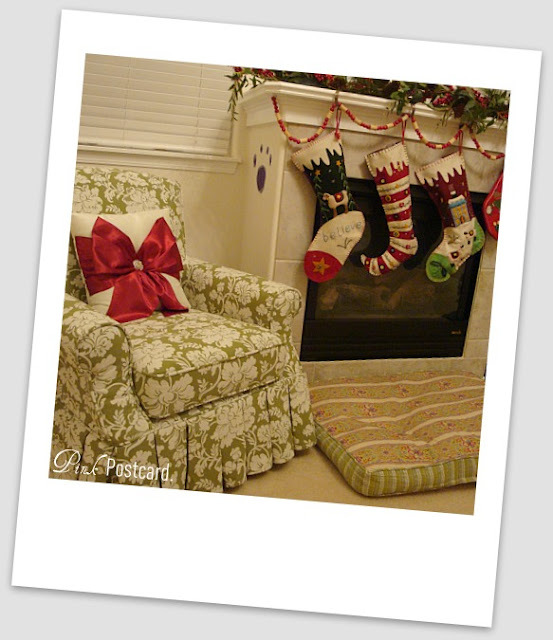 Ours has a removable set of warming compartments so it's very versatile. I got ours at Target. #6. 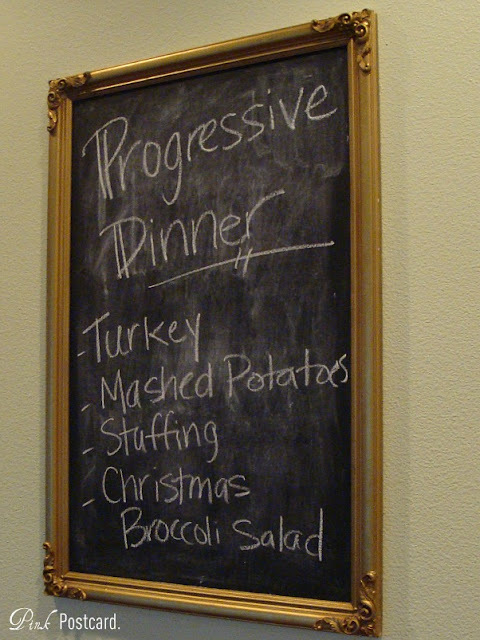 Lastly, if you've never done a progressive dinner, here's how it works. You can have as many people participate as you want, you just need to adjust your time accordingly if you have lots of stops. 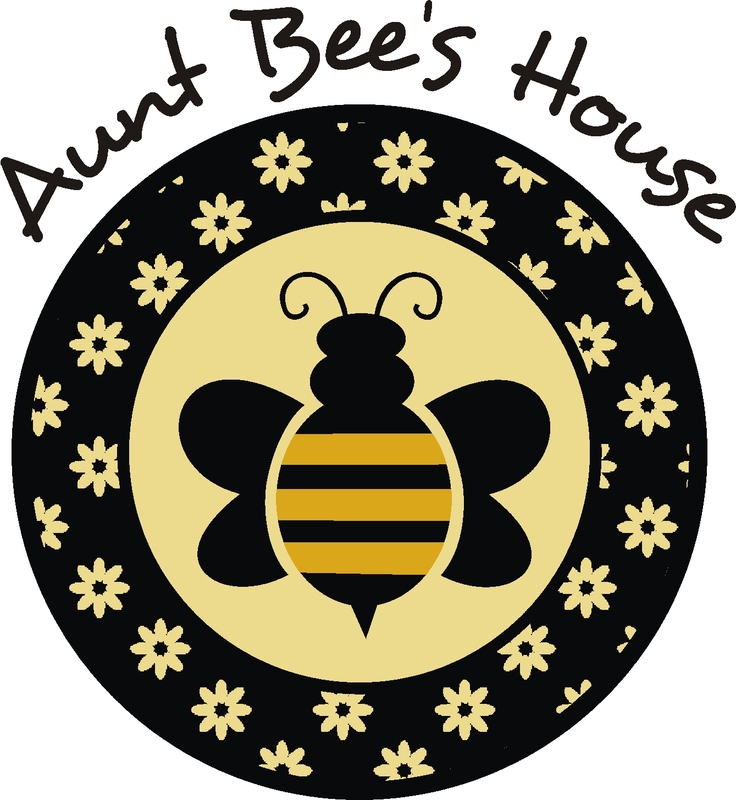 We allow about 45 minutes to one hour for each house. If you were doing an appetizer only progressive dinner, you could allow shorter time at each place. If you plan on serving alcohol through most of the evening, have a designated driver, RV, or party bus to take you from each place. It's a lot of driving for an event like this, and you don't want to be worrying about your guests. Try and keep the houses that are participating within a certain radius, so that you aren't spending the whole evening driving. Since our house was the main dish on the stop, I decided to cook a turkey. A brine is a really easy and yummy- here's the one that I use. It's very simple. I found this recipe in BHG years ago when they featured a San Francisco restaurant that sold brining kits. Heat water and salt until salt dissolves. Add in remaining ingredients, and then soak turkey in mixture. Let turkey sit overnight in the brine. You can use a small cooler (make sure you only use it for your turkey brining!!) or a large cooking bag. In my case I used a large cooking pot. Discard brine when you're done! I always use a roasting bag to cook the turkey in. No basting necessary- once it's in the oven, you are good to go. Put a little turkey pop up thermometer in the thickest part of the breast before you seal up the bag, and then roast it at 325 degrees for the amount of time needed for the size turkey you have. If you plan on making pan gravy with your turkey drippings, you rarely need to season with salt, thanks to the brine. I forgot about this, so ours was a bit salty- a good reminder to taste it before seasoning!! Pan gravy is easy to make and so much better than anything ready made. Reserve the drippings from the roasting pan. I strain mine through a strainer to get out any pieces of skin that has been left behind in the drippings. Pour strained drippings back into the pan, and put the pan on your stove burners on medium high heat and allow to come to a low boil- stir constantly to keep from burning. Here's a handy tool: if you have a Hidden Valley Ranch dressing shaker, add a couple tablespoons of flour and about 3/4 cup of water and shake mixture together. Once you have your slurry, and while still stirring drippings, slowly pour slurry into drippings to make your gravy. This will thicken as it cooks. Once it is thickened, add a bit of pepper, and serve! 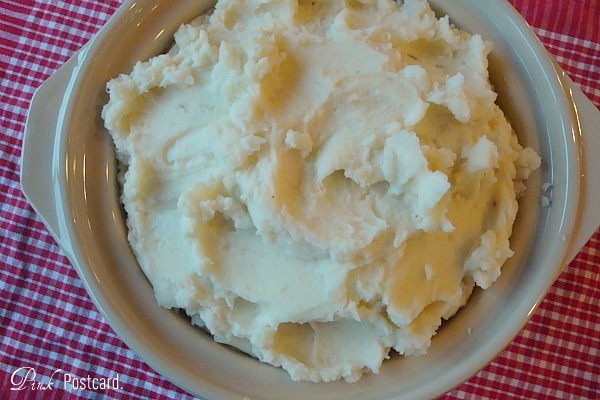 For the mashed potatoes, I just use a basic recipe, but once they are mashed with a hand masher, I whip them with my hand mixer. Nice and fluffy and smooth! You can find it and print it by clicking here. My cheat was the stuffing. Yep, right from the box. And it was delicious! It was a great night, great food, all spent with wonderful friends! Lois' entry table with our gifts she made! Janie's newly upholstered chairs. Gorgeous. 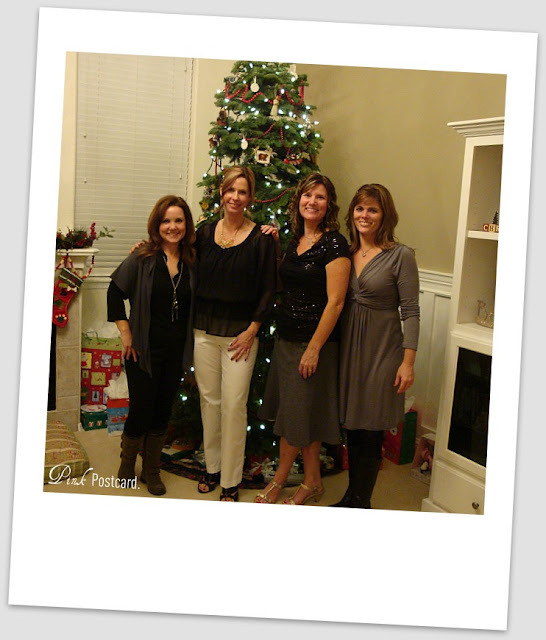 the girls- Lois, me, Janie, and Tiffany. And we weren't trying to coordinate, it just worked out that way! 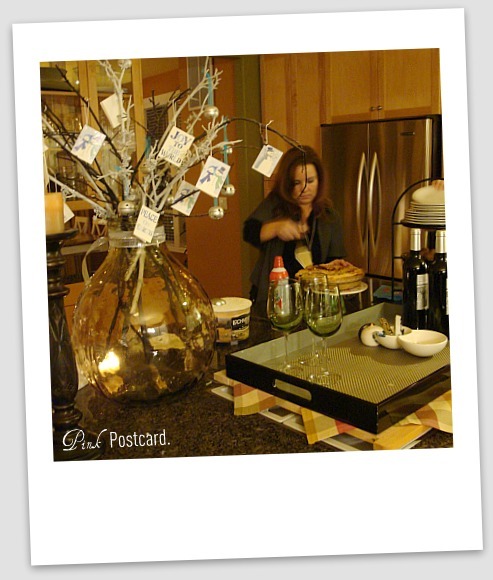 Lois' fun kitchen decor- she is the best baker I know! I shouldn't have read this post on an empty stomach. Wow, what a fun time. I also find it so much easier and more relaxing to get things done in advance. 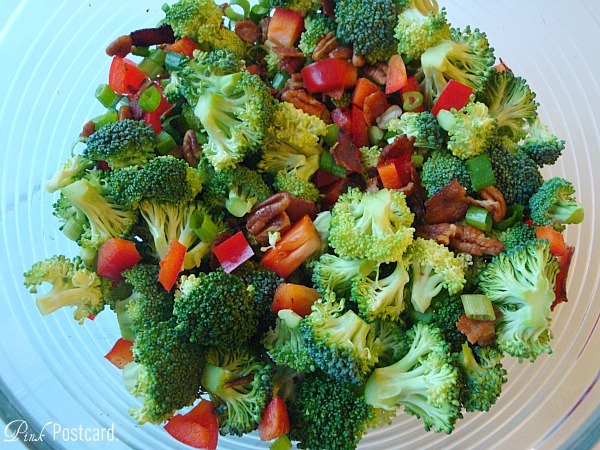 That Christmas broccoli salad looks so festive and yummy. Thanks for sharing Denise. 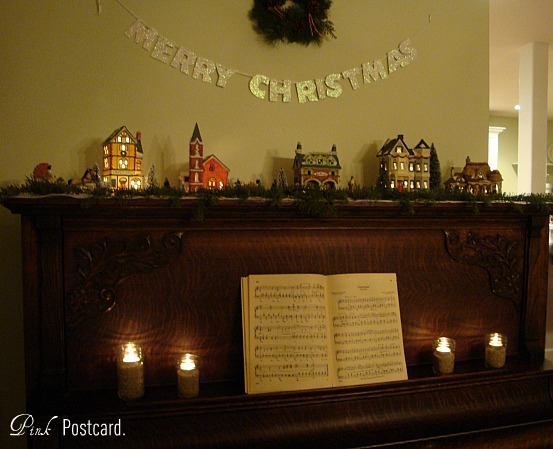 Hope you and your family have a wonderful Christmas. I love these parties, so much fun!!!! 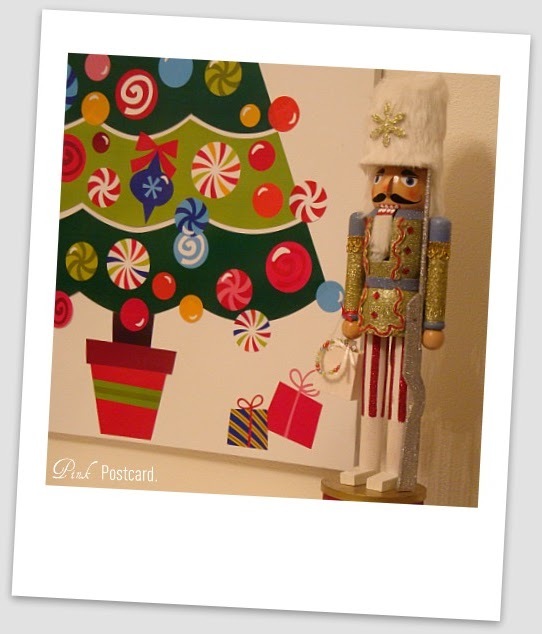 Thanks for sharing the pictures and a very merry Christmas to your gorgeous family! You can have a similar party with wine and have a wine tasting party called a Wine Crawl. My daughter/blog partner did it in her neighborhood, and it was adorable. (We blogged about it). Each home picks a wine region (France, California, Italy, local wines, etc.) and serves the wines with treats that complement them. Lots of fun.